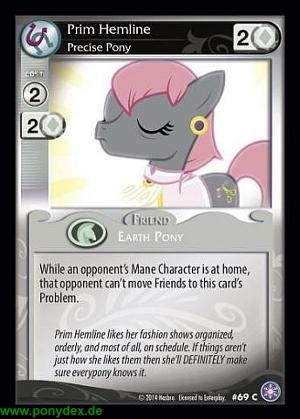 While an opponent's Mane Character is at home, that opponent can't move Friends to this card's Problem. Prim Hemline likes her fashion shows organized, orderly, and most of all, on schedule. If things aren't just how she likes them then she'll DEFINITELY make sure everypony knows it.